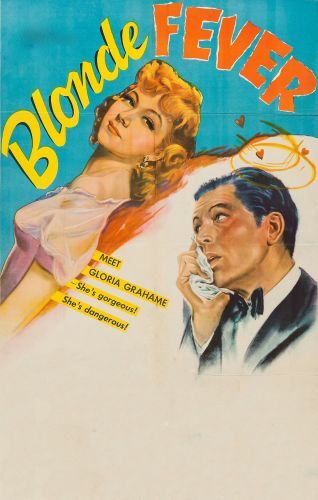 MGM's notion of a "B" picture would be an "A" production at any other studio, and Blonde Fever is no exception. Philip Dorn heads the cast as restauranteur Peter Donay, happily married to the pleasant but plain Delilah (Mary Astor). Approaching "that certain age", Donay's head is turned by curvaceous waitress Sally Murfin (Gloria Grahame, in her first important film role). At first only mildly amused by the flirtatious Donay, Sally begins turning on the charms herself when she finds out that he's won a $40000 lottery. It takes six reels, but Donay finally realizes how much he loves and needs his faithful wife, and how little Sally truly cares about him. Blonde Fever is based on a play by Ferenc Molnar, though it must have taken a lot of cutting to cram the original into 65 minutes' running time. PS: Hume Cronyn and Jessica Tandy, personal friends of director Richard Whorf, show up in unbilled cameos.